Since OpenOffice.org is free and open source application, there are many variations. The most popular edition, the one available from www.openoffice.org, may be called the original, vanilla, mainstream, upstream, or Sun version. Another popular cultivar is ooo-build. Ubuntu, SUSE, OxygenOffice, and others use ooo-build to offer unique features and fixes not found upstream. Technically, ooo-build is a set of patches against upstream and a set of related tools. Upstream has not accepted these patches for various reasons including maturity and licensing. While I generally use and recommend the upstream edition because it stable and easy to install on various systems, I wanted to try some cutting-edge features in ooo-build. There were no binary builds available with these features, so I built ooo-build src680_m241 on my Fedora 7 x86 32-bit system. Building OpenOffice.org is not a simple process. 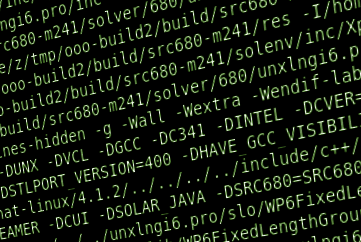 It may be the largest, most complex program on a Linux system. OpenOffice.org has numerous dependencies and more SLOC (source lines of code) than the Linux kernel. There are instructions on the OpenOffice.org wiki, but they were lacking certain bits of information pertinent to Fedora 7. Fedora ships its own, unique variety of OpenOffice.org, so it seems more common to build ooo-build on Ubuntu or SUSE than on Fedora. In term, there is less support for building ooo-build on Fedora. The above message indicates unixODBC-devel is required. When you find an error like this, either install the required package or disable the need for it (more on how to do that soon). Then, you must configure the build. Here you may choose which build-time options to enable. For example, I disabled mono because the build failed because of mono and I do not want mono anyway. As mentioned before, if the configuration process may fail. If it does, install the required packages or disable some options. Since ooo-build is a wrapper, use this command to download the actual OpenOffice.org source and the source of necessary third-party packages. Once I had everything setup right, this part took over 4 hours. In case yours fails, you should check on it more often than that. It is most likely to fail near the beginning when it checks for missing packages. For general use, I still recommend the upstream version (which may not be the version shipped with your Linux distribution), but you may require a feature in build-ooo or you may be interested in developing it.